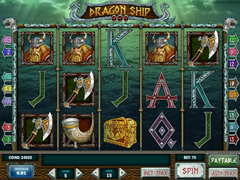 Dragon Ship Pokie Review - Play Today! The Viking Ship is ready to set sail and players are invited to join the Viking Warriors in their wealthy quest. Play’N’Go created a fun pokie filled with incredible winning opportunities on 5 reels with 15 paylines. The game presents even more winning chances boosted with features such as powerful dragon wilds, multipliers, free spin features and scatters with an outstanding rich bonus game. A well-deserved payout from the jackpot offers 2.500 coins in the bonus round. 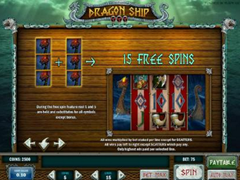 The Dragon Ship pokie is played with 1 to 15 lines, you will be able to choose how many lines are used per spin. Each one of the active lines will bare at least 1 coins, you will however be able to increase the amount of coins to 5 per line. Values of these coin can be selected from $0.01 to $ 0.25. At maximum bet a top wager amount of $18.75 will be available. A smooth animated sea gives the reels a calm background with outstanding graphics, the transparent reels offers a feel of being out on the ocean and the reels are separated by thick robe with knots to indicate the 3 rowed reels. Bright high detailed symbols are offered with decorated steel and wooden shields, Viking with a helmet presented in steel with long ivory horns, Viking axe with golden decoration, musical horn and the collection is completed by the high card symbols presented in different colours with steel outlines. The dragon with bright eyes will stand in for the wild symbols that you will be able to use and complete combinations when its shown in a combination where it will complete a combinations by substituting for other symbols. No reward prize is granted by the dragon and will only award completed combinations according to the pay-table. Get the dragon symbols stacked on the first and last reels to complete more combinations for you and also activate the free spin bonus game. Once the feature has been triggered you will receive 15 free spins and the first and last reels help in place as wild symbols. All the winning combinations you manage to complete will be awarded to you with the same amount as shown in the pay-table. A fun bonus game will triggered when you manage to gather 3 o the golden treasure chest symbols on the reels. In the bonus game you will get to choose from the treasure chests and be rewarded with up to 150 times the amount wagered when the game was triggered. This is yet another great looking pokie from Play’N’Go with outstanding smooth play. The game’s features offers a large amount of additional wins and generous payouts. The game comes highly recommended with a great theme perfectly presented.